In the emerging field of magnon spintronics, researchers investigate the possibility to transport and process information by means of so-called magnon spin currents. In contrast to electrical currents, on which todays information technology is based, magnon spin currents do not conduct electrical charges but magnetic momenta. These are mediated by magnetic waves, or so-called magnons, which analogous to sound waves propagate through magnetic materials. One fundamental building block of magnon spintronics is magnon logic, which, for instance, allows to perform logic operations and thus information processing by the superposition of spin currents. An international team of physicists from Johannes Gutenberg University Mainz (JGU) and the University of Konstanz in Germany and Tohoku University in Sendai, Japan, recently succeeded in adding a further element to the construction set of magnon logic. In a so-called spin valve structure, which amongst others comprises several ferromagnets, it was possible to demonstrate that the detection efficiency of magnon currents depends on the magnetic configuration of the device. Generally, this allows to control the transmission or blocking of incoming information. The research work has been published in the online journal Nature Communications with a fellow of the JGU-based Graduate School of Excellence Materials Science in Mainz (MAINZ) as first author. The essential aim of magnon spintronics is to replace the electrical charge as information carrier in information technological concepts by magnons. Among other things, magnons offer the possibility of wave-based computing, which provides more options for logical data processing. Magnons furthermore propagate in magnetic insulators with comparably small losses, which holds out the prospect of the implementation of improved energy efficiency of data processing. The investigated spin valve structure is a trilayer system comprising the insulating ferromagnet yttrium iron garnet (YIG), the insulating antiferromagnet cobalt(II) oxide (CoO), and the metallic ferromagnet cobalt (Co): YIG/CoO/Co. By means of the oscillating magnetic fields of irradiated microwaves the deliberate rotation of the YIG magnetization is induced, which emits a magnon spin current into the CoO. 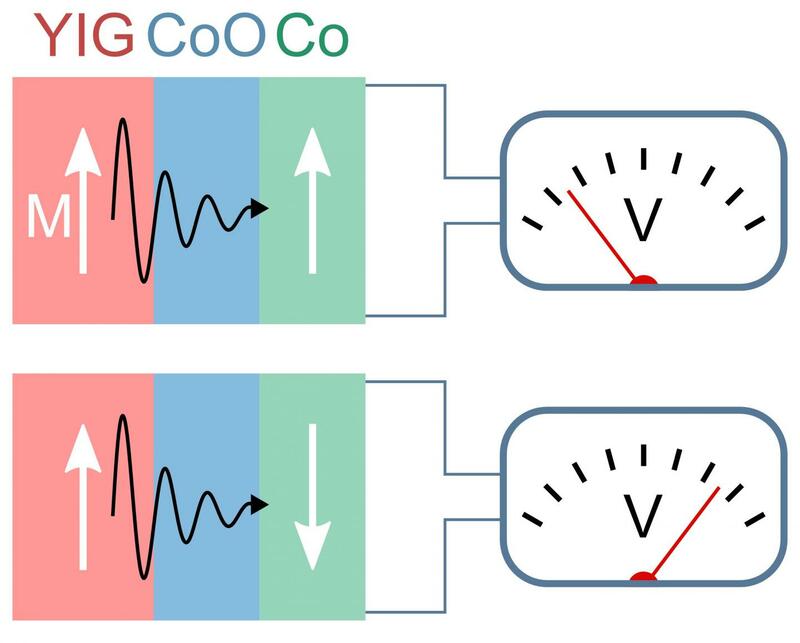 In the metallic Co layer the magnon spin current gets converted into a charge current due to the so-called inverse spin Hall effect and is thus detected. The experiment demonstrated that the amplitude of the detected signal strongly depends on the magnetic configuration of the spin valve. In the case of antiparallel alignment of the YIG and Co magnetization, the signal amplitude is approximately 120 percent larger than in the parallel state. The repetitive switching of the Co magnetization further revealed the robustness of the effect and likewise its suitability for long-time operation. "Altogether, this effect to some extent allows the implementation of a switch-like device, which suppresses or forwards the magnon current as an electrical signal," said Joel Cramer, first author of the article and member of the Graduate School of Excellence Materials Science in Mainz. "The result of our experiment is an effect which might find application in prospective magnon logic operations, thus yielding an essential contribution to the field of magnon spintronic", Cramer added. "Our collaboration with internationally leading groups within the field of spin transport in insulators follows a long tradition, especially in the Collaborative Research Center Spin-X, funded by the German Research Foundation (DFG). With the support of the German Academic Exchange Service (DAAD) and the MAINZ Graduate School, this collaboration could even be extended to long-term stays of guest students from Japan here in Mainz and vice versa," said Professor Mathias Kläui, Director of MAINZ. "The work now published in Nature Communications was mainly performed during a guest stay of two of our students and myself in Japan. I enjoyed it very much to be closer to the experiment and to even contribute to the measurements. Hence, I would like to thank the group of Professor Saitoh and the Institute for Materials Research at Tohoku University for their hospitality and the excellent collaboration," added Kläui. The theory for this work was jointly developed by the groups in Mainz and Konstanz. There is a particularly strong, long, and fruitful collaboration with the Magnetic Materials group of Professor Ulrich Nowak at the University of Konstanz. "Now that our third joint project proposal was evaluated positively, I am looking forward to further intense collective work," added Kläui. The MAINZ Graduate School of Excellence was approved through the German Federal and State Excellence Initiative in 2007 and received a five-year funding extension in the second round in 2012. It consists of work groups from Johannes Gutenberg University Mainz, TU Kaiserslautern, and the Max Planck Institute for Polymer Research in Mainz and offers excellent national and international doctoral candidates in natural science disciplines an exceptional training in materials science. One of its focal research areas is spintronics, where cooperation with leading international partners plays an important role. Problems of spin transport and the creation and detection of spin currents are investigated within MAINZ as part of the CRC/Transregio 173: Spin+X, which has been funded by the German Research Foundation since 2016.